An excellent place for a head massage, or reflexology session is Head Over Heels, in St. Neots, Cambridgeshire. A relaxing hour in a comfortable environment, with soothing music (if you want!). All of the details are online here. Got a new TomTom, and was expecting the same non-linux-friendly support from TomTom Home, and I wasn't disappointed! Well, however, a few things are different, since my old TomTom Go Live 530, but not much has changed. 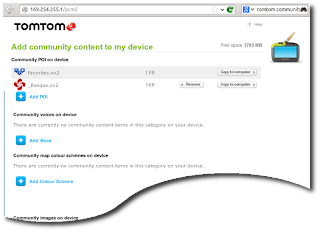 TomTom Home has been replaced with "My Drive", which is a web browser plugin, using Adobe Flash. Flash communicates with the TomTom via TCP/IP through a windows taskbar application to the device (which is plugged in via USB). TomTom have removed the feature whereby the GPS looks like a disk drive, so it looked at first like it would not be possible to update / manage favourites / points of interest on a Linux box. Well, as the device now communicates via TCP/IP, it is possible to access it via a web browser to manage certain aspects, without the need to install any software. And voila, an admin screen where I could upload / download my favourites, points of interest, voices, images, car symbols etc. Bus 001 Device 057: ID 1390:5454 TOMTOM B.V.